Due to the overwhelming response for this trip we now have a private coach exclusively for our group! Price includes early booking savings of $248.00 per person which expires 1/29/2019. Welcome to colorful Colorado! At 6 pm, meet your traveling companions for a welcome drink. Your Tour Director will prepare you for your upcoming adventure. Enjoy a sightseeing tour of Denver this morning to see historic Union Station, the Mile High Stadium, and the U.S. Mint. 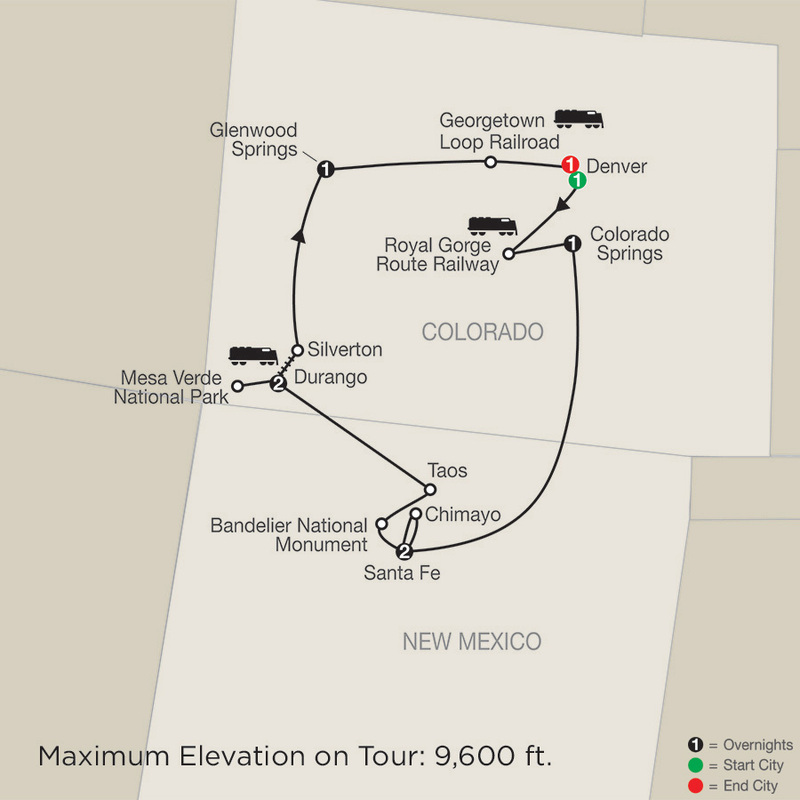 Then it’s on to the Royal Gorge for a unique experience, the spectacular ROYAL GORGE ROUTE RAILWAY, noted by President Teddy Roosevelt as “the trip that bankrupts the English language” in 1905. This memorable journey will travel through beautiful scenery, into the Royal Gorge, and along the Arkansas River. Later, travel to Colorado Springs to explore GARDEN OF THE GODS, featuring 300-foot towering sandstone rock formations against a backdrop of snow capped Pikes Peak and brilliant blue skies. 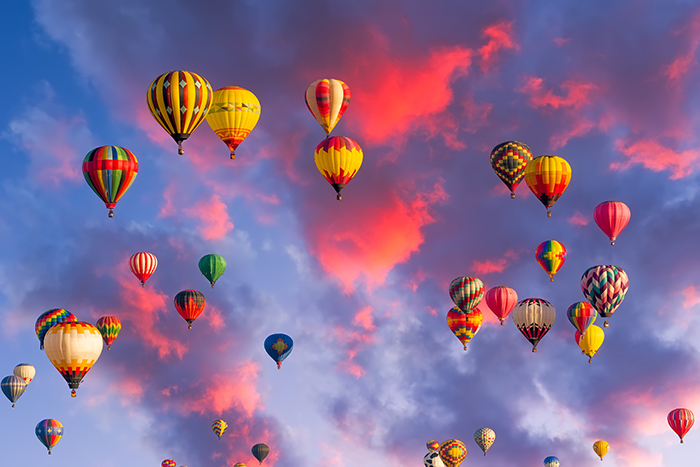 This morning experience the unforgettable MASS ASCENSION—where hundreds of hot air balloons take off and turn the sky into a virtual rainbow of colors, all of which are led by a balloon flying the American flag to the music of The Star Spangled Banner. What began as a gathering of 13 balloons 38 years ago has since turned into the largest ballooning event in the world, drawing entries from more than 28 different countries. This evening catch the popular BALLOON GLOW, where all balloons fire up their burners and light up at the same time, and the AFTER-GLOW FIREWORKS SHOW. After a morning at leisure, leave Albuquerque and drive north to Santa Fe, the oldest seat of government in the United States and an art and cultural mecca. Spend time at leisure exploring the plaza; a National Historic Landmark and the region’s central gathering place for nearly 400 years. Spend time exploring art galleries or the many boutique stores to appreciate why the plaza has been considered a storied trading center for generations. Later, enjoy dinner at a local restaurant. Experience Santa Fe up close as you embark on a guided TROLLEY TOUR of the many historic buildings, revealing the town’s Spanish, Native American, and early settlers’ heritage. Main sights include the San Miguel Mission, Palace of the Governors, Cathedral of St. Francis of Assisi, and LORETTO CHAPEL’S “Miracle Stairway.” We then visit nearby Chimayo, which was founded in the 17th century by Spanish settlers. Enjoy lunch at the Rancho de Chimayo, located in a century-old adobe home, serving some of the best New Mexican cuisine. Visit SANTUARIO DE CHIMAYO and learn about the miraculous healing powers that still attract thousands of pilgrims each year. Return to Santa Fe, where the remainder of your day is at leisure. Leave Santa Fe, stopping to explore the ancient Anasazi Puebloans and their cliff dwellings at BANDELIER NATIONAL MONUMENT. Next, visit the adobe town of Taos on the high-desert mesa for free time to explore this ancient meeting place. Continue into Colorado and arrive in Durango, a town born in the Gold Rush and silver-mining era. Tonight, perhaps browse the many shops on Main Street, or enjoy a cold pint at one of the city’s local breweries. Today, visit MESA VERDE NATIONAL PARK, a UNESCO World Heritage Site. See Spruce Tree House, one of the best-preserved cliff dwellings. Also, visit the museum that depicts the story of the people who once thrived on this 8,000-foot plateau, and stop at a great vantage point for pictures of Cliff Palace (one of the largest of the 700-year-old Anasazi dwellings). This evening enjoy dinner at a local restaurant. This morning, board the DURANGO & SILVERTON NARROW-GAUGE RAILROAD for a scenic ride through San Juan National Forest. The legendary steam train hugs steep canyon walls as it winds its way through Rio de las Animas Canyon. Arrive in Silverton, once a major mining town that owes its name to the bragging statement by an early miner: “We have no gold, but silver by the ton!” Then, continue to Glenwood Springs for the evening. Why not unpack your swimsuit and head down to the hot springs? The world’s largest and welcoming visitors for over 125 years. Entrance to the HOT SPRINGS pools are included with your stay. Travel through the beautiful Colorado mountains and board the historic GEORGETOWN LOOP RAILROAD, sit back and relax as you enjoy the beauty of the rugged Rocky Mountains plus views of Clear Creek Canyon. This afternoon continues east to Denver, where your Tour Director hosts a special farewell dinner. Wonderful conversation and cuisine make the perfect finale for your vacation. Price of $3510.00 is per person based on 2 people sharing a room and includes roundtrip airfare from Myrtle Beach to Denver on American Airlines, roundtrip airport transfers and taxes. Price includes early booking savings which expires 1/29/2019. Deposit of $250.00 per person is due at the time of booking -$100.00 of the deposit is non-refundable. We’re showing fantastic vacation deals in all forms including our social media outlets. It’s simple, just follow us! Building memories... Your next vacation is waiting for you. Thomas Hogan Vacations is the premier travel agency in Myrtle Beach with over 25 years in business, specializing in personalized travel experiences. Thomas Hogan offers travel destinations which includes a Spain & Portugal escapade, a cruise to Alaska, a Northern European cruise, a trip to Rome & Greek Isles, a Panama Canal Cruise, a cruise to the Southern Caribbean and a tour of Northern Italy. Custom vacation packages include roundtrip airfare, lodging & accommodations, dining, transportation and more. Thomas Hogan offers vacation packages for couples, groups or individual travel. Thomas Hogan Vacations is affiliated with Travel Leaders which gives us the best global travel contacts. Thomas Hogan's corporate office is located in Myrtle Beach, South Carolina.